As we mentioned last week, NSTA and NBC Learn have teamed up with the National Science Foundation (NSF) to launch “Chemistry Now,” a weekly, online, video series that uncovers and explains the science of common, physical objects in our world and the changes they undergo every day. The series also looks at the lives and work of scientists on the frontiers of 21st century chemistry. All in celebration of the International Year of Chemistry, which gets under way this Thursday, Jan 27th, at UNESCO Headquarters in Paris. If you happen to be there, and see some chemists presenting exciting science, send us pictures or comments. If not, we understand… the excitement of chemistry in your own classroom is simply too alluring. Speaking of alluring, nothing is more beguiling than the scent of a good cheese. The stinkier the better. So we present week two’s offering, the Chemistry of Cheese. View the video, try the lessons, and let us know what you think. Photo of girl scrunching her nose by Kaptain Kobold. Video: “The Chemistry of Cheese” (part of a 6-part Cheeseburger Chemistry series) uses cheese-making to explain protein denaturing, coagulation, and the difference between chemical and physical change. The video is located at the top left of the collection of resources. Middle school lesson: in this lesson, students will blow up balloons using yeast, observe a chemical change, and investigate the variables that effect this chemical change. High school lesson: through this lesson, students will observe a series of chemical reactions involving common kitchen chemicals, and use their observations to design and carry out an experiment to determine the identity of an unknown kitchen chemical. 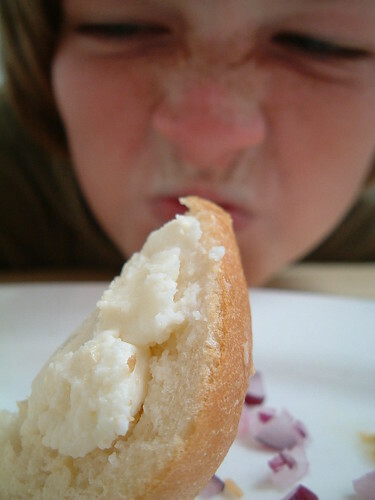 This entry was posted in Videos and Lessons and tagged cheese, lesson plans, unknown substance, video, yeast. Bookmark the permalink. Trackbacks are closed, but you can post a comment. I was excited by the premise of your video on physical and chemical changes related to cheese until it started with the very misconception I’m trying to break! Just because a change is reversible does NOT mean it is a physical change rather than a chemical change. Most chemical reactions ARE reversible! This oversimplification that students learn in younger grades is very hard to undo- sad to see NSTA reinforcing it. You’ve argued that is not the case. Perhaps you know of a good online resource that makes the case. Could you point us in the right direction? I definitely wanted to construct a small comment to be able to express gratitude to you for all the precious strategies you are placing here. My rather long internet search has now been compensated with excellent facts to talk about with my company. I ‘d assume that most of us readers actually are unequivocally fortunate to dwell in a superb network with many outstanding people with interesting secrets. I feel really blessed to have encountered the webpages and look forward to plenty of more awesome minutes reading here. Thank you again for all the details.